Dapple Cat Is On Alert! my over-used cat, the light is sunlight coming thru the big 'ol rhododendron in the front yard, by the way the western rhododendron is the official state flower of my fair state of Washington. I agree this feels very painterly and artistic! This is absolutely outstanding. It has such a painterly look. Excellent use of light.....on a cat. Great shot. ;-) Good luck! 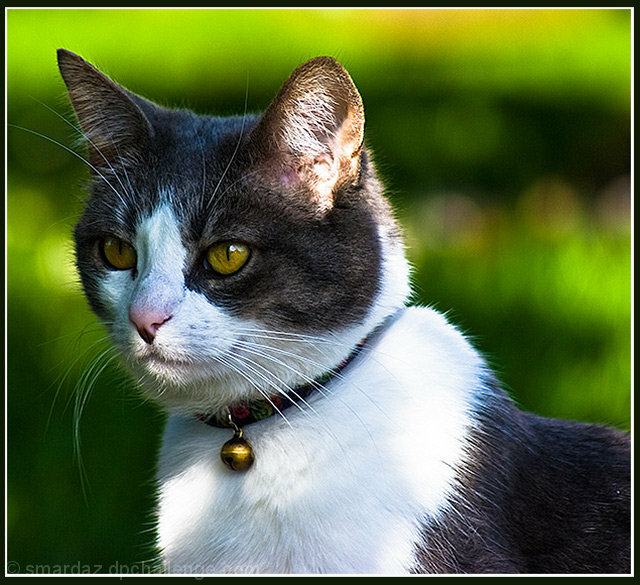 My cat looks very similar, several shots on DPC. I like. My eye is drawn straight to the cat's face. Good use of depth of field. Great use of DOF to really isolate your subject. Great colour, depth of field and sharpness. Nice! Wow - Looks exactly as I remember a part in Pink Floyd's The Wall. Just after the child says, "Look Mommy there's a little plane up in the sky". Then this very cat runs after a dove. A little spooky. Dappled effect enhances your image rather than complicating it as I've seen in so many others. Subdued. Good DOF, Good Focus, GREAT capture. Proudly hosted by Sargasso Networks. Current Server Time: 04/20/2019 04:25:38 PM EDT.